THERE were emotional scenes when gorilla brothers who hadn't seen each other for more than two years were reunited at Longleat Safari and Adventure Park. 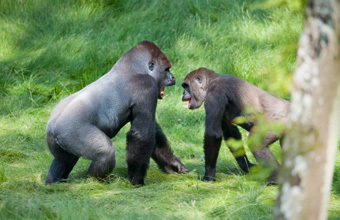 The brothers, who were born at Dublin Zoo, met up again at the spectacular new Gorilla Colony enclosure at the Wiltshire safari park. "We had been slightly concerned how they would react to each other and whether the big brother could put up with little Alf's playfulness. "However they have formed a really tight bond in just a few weeks and Kesho is actually incredibly tolerant; allowing both Alf and six-year-old Evindi to jump all over him."